Our experienced project managers have a major role to play in our flexible projects operation. They supervise the project from start to finish and represent both the client's interests and those of Smulders itself. We strive towards active collaboration and open communication with the client. Our open and transparent approach to communication, combined with our flexible attitude, leads us to raise any issues immediately and begin looking for solutions. Smulders aims to work within the spirit of the contract to establish a proactive approach to client collaboration that both parties will find enjoyable and effective. It is this philosophy of sharing the client's perspective that ensures our clients can always count on Smulders, both during and after every project. An important and key component of Smulders is its large, in-house engineering department. Our experienced engineers take care of the design and assessment of the desired components, according to the required standards and quality demands. The engineering department includes over 15 highly qualified structural and stability engineers and over 50 draftsmen, located across our various facilities in Arendonk, Balen and Bangalore (India). All necessary engineering documents and detailed drawings can therefore be delivered in-house, without the reliance on external consultants. Our acquired engineering knowledge allows us a significant head-start in efficiency, by taking the practical execution into account from the very start, as well as the possibilities and restrictions of the logical process. Surface treatment is considered a critical process in the manufacturing of steel constructions. For this reason, Smulders invests in the right people and high-quality materials. 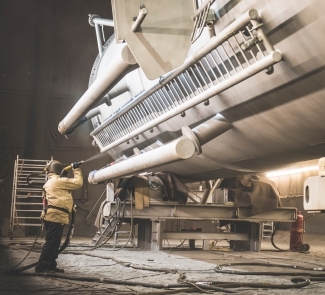 Most of our production units have their own blast cabinets and paint spray area, where the capacity can be adapted and attuned to meet both market demand and product portfolio. This is illustrated by our blast cabinet in Arendonk, which can be operated manually as well as robotically. Besides this blast cabinet, Iemants also has various automated blasting machines and a paint spray hall measuring no less than 7,200 m². At Willems, we have taken things even further by installing a blast cabinet that allows for modular extension. In addition, we have the equipment to handle elements weighing over 120 tonnes a piece. 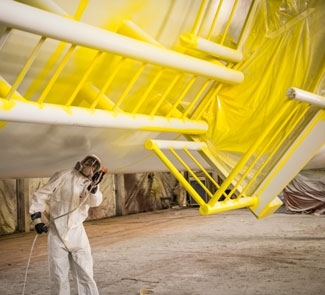 The adjoining paint spray hall covers a surface of 2,500 m². A second blast cabinet with adjoining paint spray hall provides another 2,000 m² of capacity. Our third and largest production facility is located in Hoboken. Its first production area of 12,000 m² contains a blast room and a paint spray hall, both equipped with a sliding roof to enable the handling of components of up to 600 tonnes. This area is used mainly for manufacturing tube foundations (Transition Pieces or TPs) for the offshore wind industry. Each working day of the year we blast and spray one foundation at this unit, which adds up to about 260 tube foundations per year. The unit is equipped for four manual shot blasters, while a robotic blaster can take over any pieces with common dimensions. Certified in-house Nace coating inspectors provide the necessary quality assurance.